Edward Isaac Bot was to be a 2-3' multi-functional, useful, household robot. Good thing Paul and I weren't being ridiculously ambitious and were instead starting with a small, simple project. <- Sarcasm. Here's some (simple) thoughts about wheel placement & size, and a later sketch of EIB overall shape. 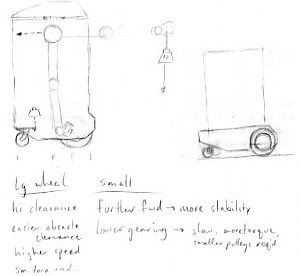 Basically, contemplating more forward wheel placement for stability, larger wheel size for more easily driving over small household obstacles. (Since this was written I got a Jeep and took up four-wheeling. Perhaps I can draw from some of my experiences in that realm). The note about speed assumes a set of motors I'd already purchased, otherwise you could select wheel size & gearing for appropriate maximum speed.